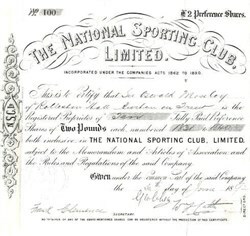 Beautifully engraved certificate from the National Sporting Club, Limited issued in 1892. This item is hand signed by 2 of the Company's Directors and its Secretary and is over 112 years old. The National Sporting Club is one of the oldest sporting clubs in the world. Founded in 1891 by the fifth Earl of Lonsdale and Marquis of Queensbury, the Club is famous for staging historic fights at its Caf� Royal home. Today the Club embraces all sports offering premium corporate hospitality at major sporting events as well as theatre, ballet and opera packages and banquets throughout the UK honouring legends from international sport and the entertainment world.